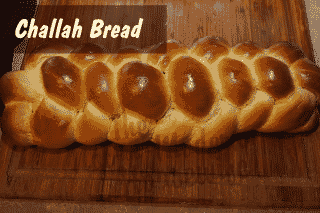 Challah bread is a braided enriched dough made with eggs. It is traditionally a six-strand braided loaf, but can also be made into round loaves or 3- or 4-strand braids. Not only are the braided loaves impressive looking,they are perfect for family meals where pieces can easily be torn from the loaf as it is passed around the table. Keep reading for a detailed explanation of how to master a six-strand loaf of bread. Challah bread originates from Jewish culture, where it is traditionally served during special feasts such as Hanukkah, Rosh Hashanah, and Shavout. 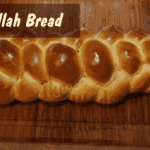 There is a lot of symbolism surrounding the appearance and serving of challah bread. Some bakers and holidays use a variation on the braid to symbolize different meanings such as love, truth, peace, and justice. A blessing is said over the bread before it is served, thanking God for providing food to eat. This Challah bread recipe makes two loaves of bread, representing the two portions of manna that was sent down to the Israelites on Fridays during the Exodus from Egypt. You can serve one loaf of bread with dinner, and save the second loaf for making French toast for breakfast. You could also take two loaves of bread to a large dinner party or potluck to share with others. This is a soft and flavorful homemade bread that keeps well and is a popular compliment to a variety of dishes. Since Challah bread is an enriched dough, it needs to be baked to a higher internal temperature to cook all the way through. The crust should be a golden brown, and the internal temperature of the loaf should be 195 degrees F. The temperature can be taken with a food thermometer. There should also be a hollow thud when you tap the bottom of the loaf. Egg wash is brushed onto the loaves before they are placed in the oven, giving the bread a soft crust and a golden appearance. The traditional egg wash used is egg and water because milk is not a kosher food. If you choose to use milk instead, it can be substituted in place of water. Don’t let its complicated appearance intimidate you. While it may take a little practice to make it look perfect, the braid itself is rather simple to master. I’ve included a video below to show you how to lay out the strands and form the braid. There is a rhythm to braiding bread that I find relaxing. Whisk the yeast and warm water together in the mixing bowl of a stand mixer and let stand for 10 minutes to activate the yeast. 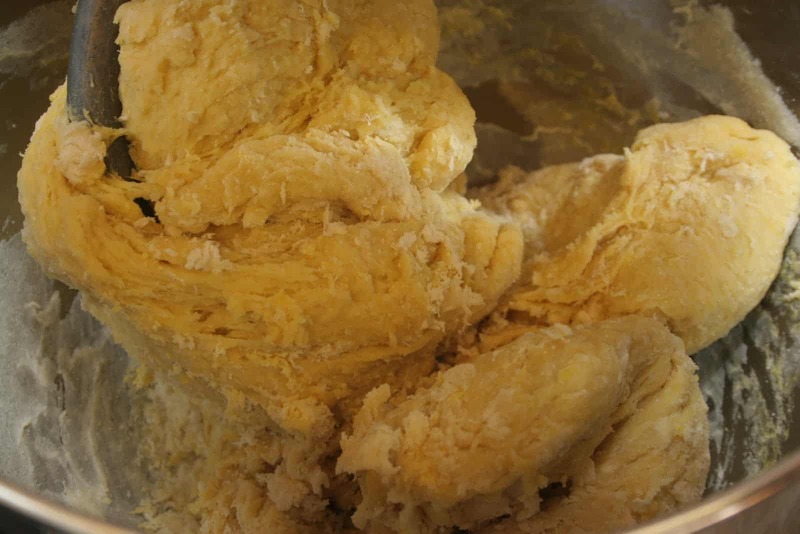 Add 5-6 cups of flour to start along with the rest of the ingredients, making sure to avoid letting the salt come into direct contact with the yeast. Using a dough hook, mix on low speed for about 3 minutes until all of the ingredients are combined. Add more flour as needed until the dough no longer sticks to the mixing bowl. Increase the mixer to medium speed and mix for about 5-6 minutes until proper gluten development is achieved. The dough will become smooth and elastic. It should also feel a little stiff so it will braid properly. 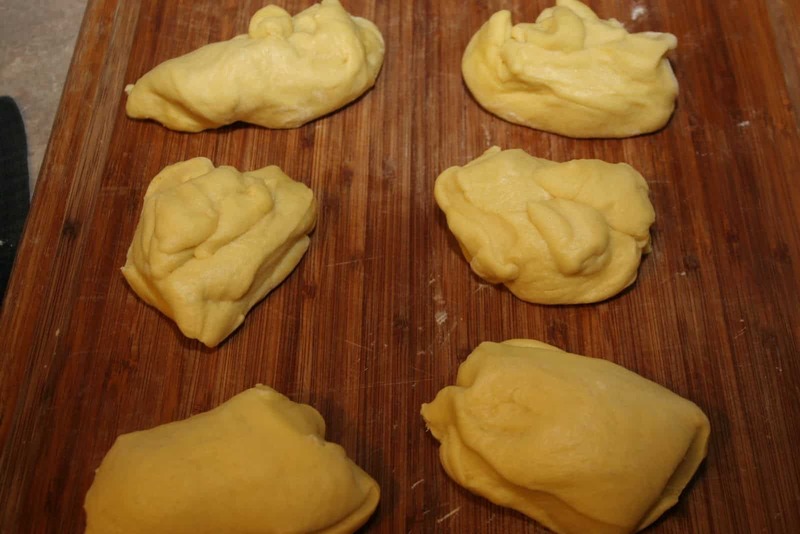 To test for gluten development, take a pinch of dough and slowly pull it apart until you can see light through the dough. This is called the Window Pane Test. 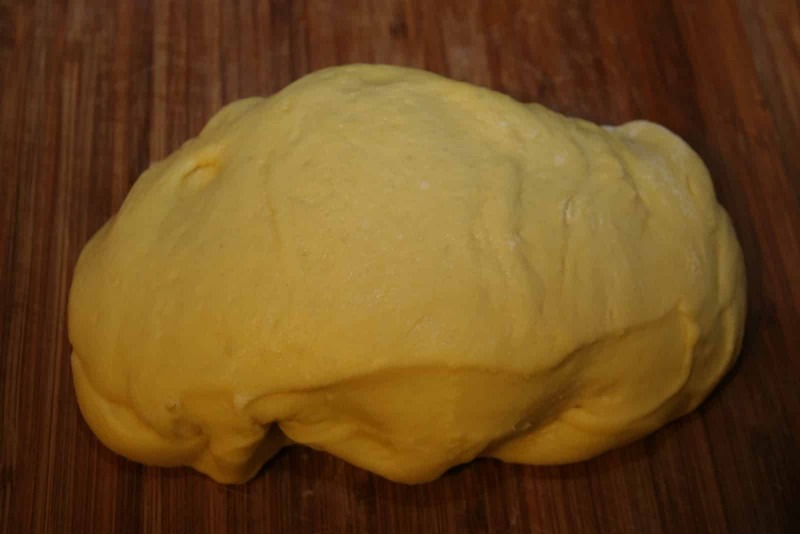 If you can pull it apart without the dough breaking, the gluten is properly developed. Spray a large bowl with non-stick spray. Place the dough in the bowl, cover, and allow the dough to rise in a warm, draft-free place for about 2 hours until doubled in size. Fold it over once halfway through bulk fermentation. 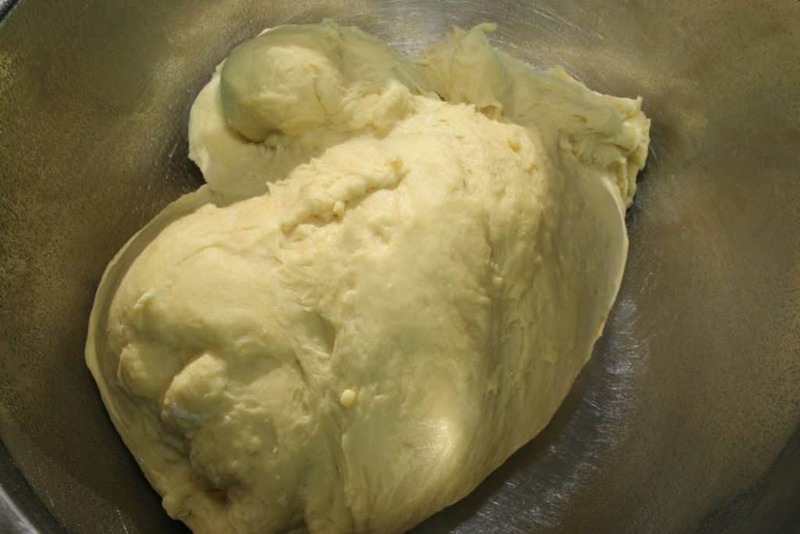 Turn the dough onto a floured surface and divide in half. Cover one half of the dough with plastic while you work the other half. Divide one half of the dough into six equal pieces. Each strand will weigh approximately 3 oz. You need to weigh the strands and get them as equal as possible so your braid looks even. 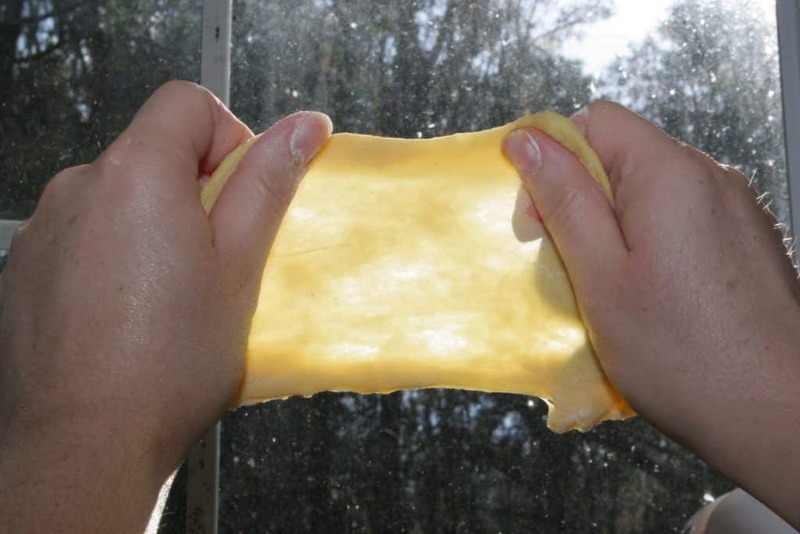 De-gas the dough by pressing flat. Pinch the sides together so it starts to form a strand. 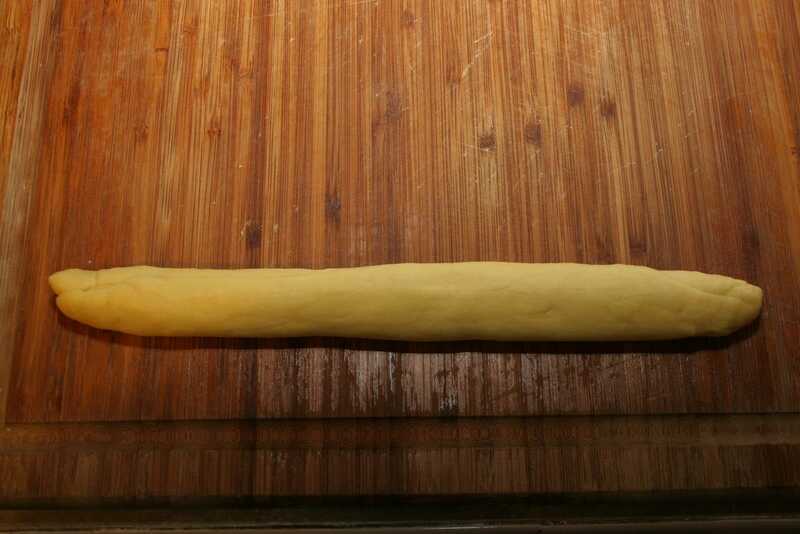 Roll the dough out into a smooth strand. 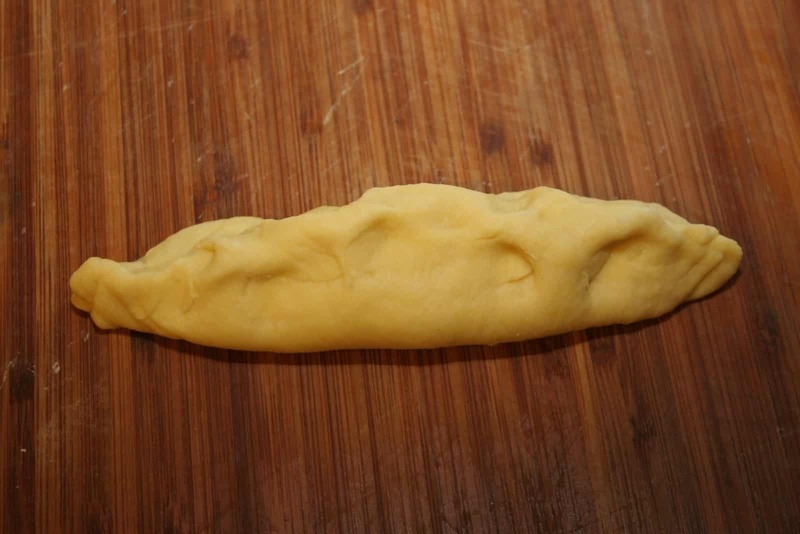 It will be short at first, but this is just to initially shape the dough. Repeat this process for all 6 strands. Cover the strands with plastic and let rest 10-20 minutes. This will let the gluten relax so they will roll out properly. While you wait, you can portion the other of the dough for a second loaf. Roll the strands out to the desired length. They should be about 1″ in diameter for a good braid. These strands are about 18″ long. Be careful not to pull the strands too much while you are braiding them. 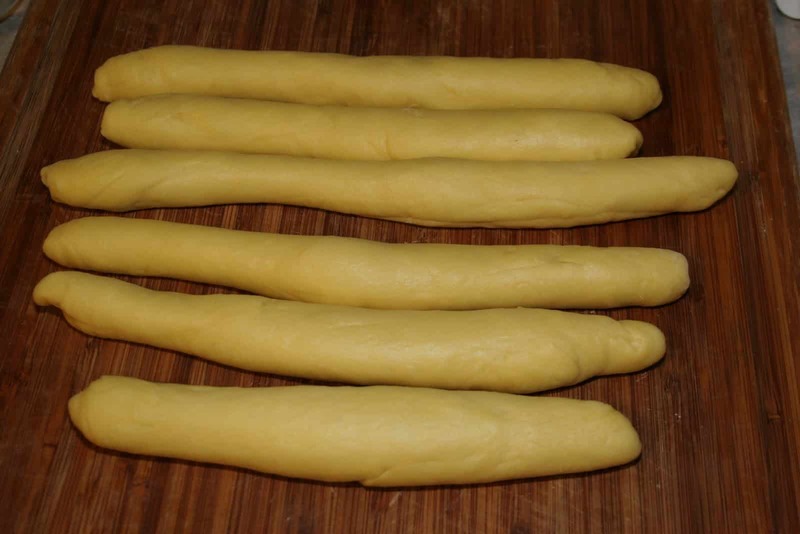 Pulling the strands can give them stretch marks, which will make for a less desirable appearance on the finished loaf. It can be difficult to learn to braid bread without having stretch marks, and it requires some practice. Repeat this process for the second half of the dough until you have two braided Challah loaves. Set the loaves on a parchment paper lined baking sheet, well spaced from each other, and cover with plastic. Let the dough rise 1 1/2 to 2 hours. Preheat the oven to 375 degrees F. Whisk together the ingredients for the egg wash. 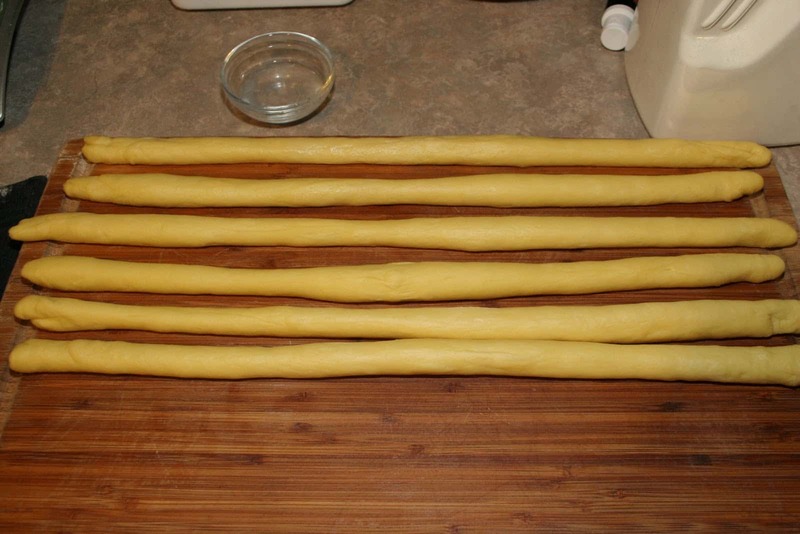 Using a pastry brush, brush the loaves with the egg wash, making sure you get into the braid. Try not to use too much egg wash that will drip onto the baking sheet. Bake for about 30 minutes or until a digital thermometer inserted in the center of the loaf reads 195 degrees F.
Remove the loaves from the oven, and transfer from the baking sheet to a wire rack to cool. This bread is great for dinner or sandwiches. It also makes excellent French Toast.